Almost half of those living in the United States today can trace their roots back to a descendant who entered the country through Ellis Island, the gateway to America. The island, situated in New York Harbor, closed its doors on November 12, 1954 after processing over 12 million immigrants since officially opening on January 1, 1892. On the first day Ellis Island was open for business, 700 immigrants arrived to start a new life in America. The first of the first was a 15 year-old Irish lass from County Cork named Annie Moore. Half a million more would follow in just 1892 alone. But immigrants had been arriving in America long before they were being processed at Ellis Island – just ask the Native Americans. Ellis Island was used as part of the nation’s defense system since 1808 and right through the Civil War. When nearby Bedloe’s Island also fell into disuse as a fort, the Statue of Liberty was erected there. By that time, millions of immigrants had already poured through New York Harbor. There was no screening or regulation from 1855 to 1890, and eight million newcomers, mostly immigrants from western and northern Europe, walked off their ships and into the country with no hassle at all. For awhile. That is, until the Protestant ruling class began to worry that the over-abundance of available cheap labor was driving down wages and that “ignorant” immigrants would be used as scabs to bust the unions. Pressure was then put on the federal government to control the influx on immigrants entering the country. 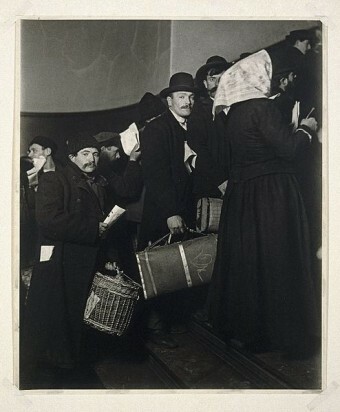 Even then, not everyone who arrived by boat at Ellis Island was subjected to federal scrutiny. First and second-class passengers were usually interviewed on board the ship and allowed to pass through without incident. The authorities assumed that anyone who could afford to travel in such style was no risk of becoming a burden on society. However, those in third class or steerage were afforded no such niceties, were often treated like human cargo, and put through a vigorous screening process before being allowed to set foot on American soil. That said, for all the effort, only two percent of immigrants were turned away in the end. During World War I, Ellis Island was used more often to detain suspected enemies than it was to process immigrants. When the war was over, quota laws were passed by Congress, and the National Origins Act of 1924 greatly limited the number of immigrants from certain countries allowed into the United States. Those wishing to immigrate to America would now have to apply first at the U.S. embassy in their country. During World War II, Ellis Island once again served as a detention center for the enemy, and during the post-war years, suspected Communists were held there as well. It was also used as a holding and deporting center for illegal immigrants, a sad reversal of its original purpose. Finally, on November 12, 1954, Ellis Island closed for good. Why Are Strikebreakers Called Scabs?